In their new years’ resolutions, many people assert to improve their discipline and priorities for 2019. What can help a lot in achieving these personal or professional resolutions, is having the right tools. What tools? For example Kopano’s new productivity features like widgets, categories and To-Do lists. I’ll share with you how these tools help me. As we all know you can switch between contexts in WebApp. Email, Calendar, Contact, Tasks, Notes, and more when plugins are enabled. While those views give an excellent overview of each individual context, you can’t see them all together in one integrated view. This is where the widgets in WebApp come in. Create your own ‘Today’ view, set the view as startup context and begin your day with an overview of your pending work. A while ago, in WebApp 3.4.0, we’ve introduced new and updated categories. Categories can be used to organize your information. 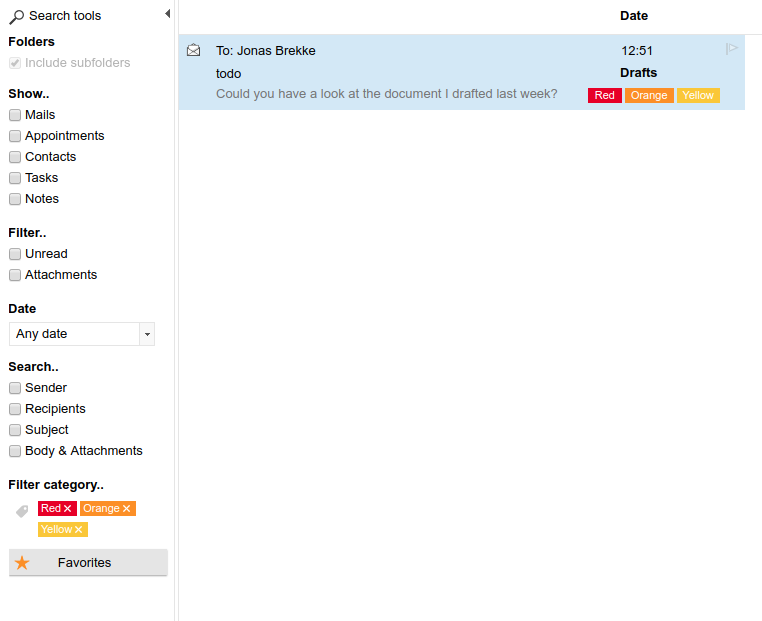 The category name, combined with colors, can be set on emails, calendar items, contacts and more. 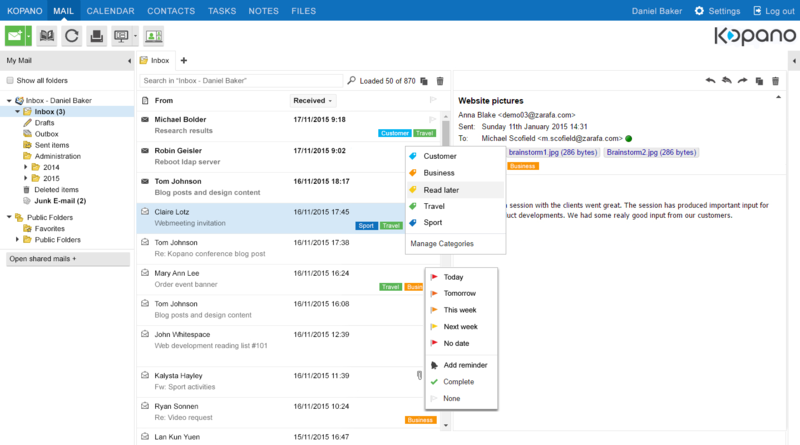 Categories in your inbox are prominently displayed in each email, allowing you to see what is what in one glance. You can create your own categories or as an admin, you can create system wide categories. With the ability to search for categories you can easily find your categorized items again. When scanning too many emails in a row, I used to find myself needing extra time to really dive into some individual mails before responding, only to forget about it completely, and never writing that reply. WebApp now has the ability to add/set a flag to email items in order to mark them for follow-up. The flags menu allows you to select a date before which you want to follow up. This also creates a reminder, so that you can’t forget about the To-Do item. Personally I use this a lot when I check my email during the weekend and want to pick it up next workweek. So there you have it. Three ways to organize your store. We’ve looked at widgets, categories and flags (to-dos). Fairly trivial ways to organize and optimize your productivity. Give it a try and let us know what you think!